All Crewed charter yachts shown on this page represent some of the best of the best in our studied opinion. We know the crews and yachts very well. But, it’s simply not possible to list them all. Please ask if you’re not seeing what you want. 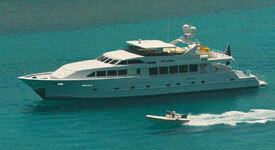 Slip Aweigh Charters specializes in yacht charters in the Caribbean. Areas covered: The US and British Virgin Islands, The Bahamas (and Florida Keys), the Grenadines and New England when the yachts based in the Caribbean charter there. Many of these boats also charter in other areas seasonally. For example, some go to New England or the Mediterranean in the Summer months, some offer charters in the beautiful Grenadines or Bahamas for the Summer season and some are in one place year round. And some do not offer Summer charters at all but perform maintenance while on vacations. We know how make the perfect match of yacht and crew specifically for your personal needs and preferences. Just give us a call or fill out the form to outline your ideas for your party, what you’d like to do, when and where, and we’re off and running. You will receive our reply within 24 hours and often much more quickly. Definition of Yacht: a vessel propelled by sail or power, used especially for pleasure cruising. Traditional sailing yachts or Monohulls are designed with single hulls. 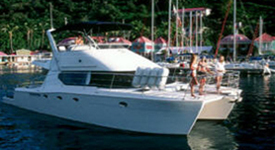 Comfortable accommodations are offered on these yachts for parties of 2 to 8 persons. Those who prefer this form of yacht charter usually appreciate the exhilaration of sailing along to windward with more than a 5 degree tilt (heel). Select from the Featured Yachts below or click on the link for “View All Sailing Yachts”. Prices described as “High” and “Low” cover the full range of potential pricing offered by each yacht. Affecting these prices is the time of year you’d like to come, how many people coming along and number of cabins required for comfortable sleeping. The standard charter term is for 7 nights and 8 days from 1200 noon to 1200 noon. Shorter terms using the standard minimum term of 5 days can be arranged and prorated accordingly. Captain Only Some yachts offer modified service levels such as Captain Only where the charterer pays for all food, drinks, mooring fees, and additional fuel and water used. “Half Board” Another modified service is termed “Half Board” where a reduced number of meals are served on board and the others are taken on land at the charterer’s expense. This usually includes all breakfasts, 4 lunches and 3 dinners on the boat. This is a great idea for saving a bit of money while meeting and having fun with the locals on the islands. It’s great for kids when they come along. 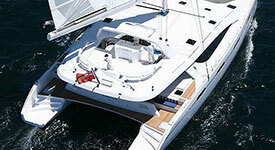 Special offers: Often yachts will offer special pricing periodically. We are on top of specials for the yachts we present to you and will take advantage of any special offer posted. Note: Every effort is made to provide current and correct pricing. Actual pricing will be determined once details concerning dates of travel, number of persons on board, service level desired and area in which to charter are received. We are proud, long-time members of CYBA (Charter Yacht Broker’s Association). Each CYBA member must meet rigid membership requirements, including experience in the field, proper use of charter documents, ethical business practices, attendance at charter yacht shows to see yachts and meet the crews, and a review by his or her peers, prior to acceptance. This is the body which oversees all Charter Yacht Broker Members and establishes guidelines to which Slip Aweigh Charters strictly adheres. This organization is dedicated to maintaining integrity, security and professionalism in our field to better serve you, our valued client. The yachts presented for charter and their particulars displayed on Slip Aweigh Charter’s website are provided in good faith and while believed to be correct are not guaranteed. All information is subject to change without notice prior to your charter booking and mutually signed agreement. All details and particulars will be confirmed for your charter by a professional representative of Slip Aweigh Charters during the process of choosing your charter yacht. At the time of the actual booking of your chosen yacht and term, you and the yacht’s representative will mutually agree to all terms and inclusions by signed Agreement. Put simply, Slip Aweigh Charters is your lifeline to the yachts, the agent and to you. 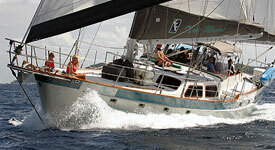 We have been sailing these waters as crew and Charter yacht owners for more than ten years. © Copyright Slip Aweigh Charters | All Rights Reserved.